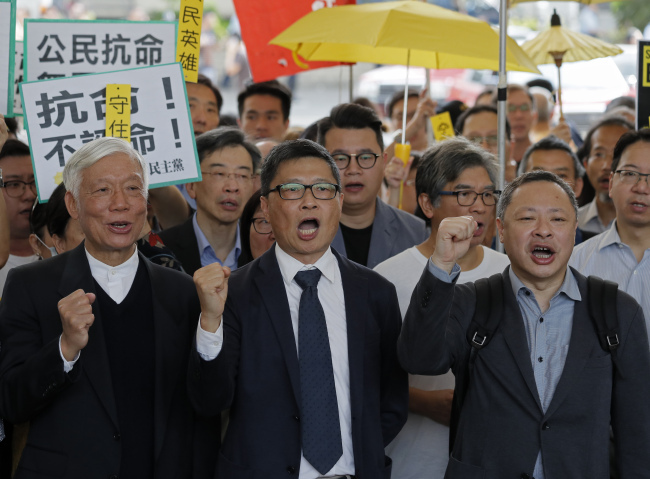 HONG KONG, April 8, 2019 (AFP) - Three leading Hong Kong democracy campaigners will find out if they face jail Tuesday for their involvement in mass rallies, with their trial sparking renewed alarm over shrinking political freedoms under an assertive China. They are among nine activists facing rarely used colonial-era public nuisance charges for their participation in the 2014 Umbrella Movement protests calling for free elections for the city's leader. The trio founded the pro-democracy "Occupy Central" movement in 2013 which joined the student-led Umbrella Movement a year later that brought parts of the city to a standstill for months. Hong Kong's Justice Department eventually brought charges against the group leaders more than two years after the protest ended. "If prosecutors are successful, there is a real danger that more and more people will face charges for peaceful activism. The authorities appear intent on trying to silence any debate about sensitive issues in Hong Kong, especially those relating to democracy and autonomy," said Man-kei Tam, Amnesty's Hong Kong director. The venue -- Kowloon Union Church -- was where the trio first announced their "Occupy Central" manifesto six years ago. "What we are facing is the most powerful autocracy in human history and we have to take back our democratic rights from its hand," a tearful Tai told his supporters, referring to China's increasingly assertive control over the city.